The Artist of the Month for March and April is Sean Kelley from Conway, NH. 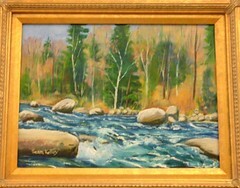 His oils are mostly of local landscapes familiar to us all. At left is his oil of the Swift River in the autumn. Cat Brennan’s photography of locally-grown flowers and vegetables will be on display in the library in May and June.